Inactivated polio vaccine (IPV) was developed in 1955 by Dr Jonas Salk. Also called the Salk vaccine IPV consists of inactivated (killed) poliovirus strains of all three poliovirus types. IPV is given by intramuscular or intradermal injection and needs to be administered by a trained health worker. IVP produces antibodies in the blood to all three types of poliovirus. In the event of infection, these antibodies prevent the spread of the virus to the central nervous system and protect against paralysis. As IPV is not a ‘live’ vaccine, it carries no risk of VAPP. IPV is over five times more expensive than OPV. Administering the vaccine requires trained health workers, as well as sterile injection equipment and procedures. An increasing number of industrialized, polio-free countries are using IPV as the vaccine of choice. This is because the risk of paralytic polio associated with continued routine use of OPV is deemed greater than the risk of imported wild virus. 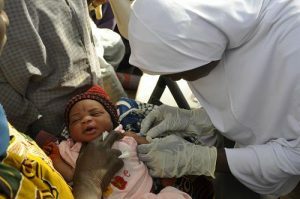 However, as IPV does not stop transmission of the virus, OPV is used wherever a polio outbreak needs to be contained, even in countries which rely exclusively on IPV for their routine immunization programme. Once polio has been eradicated, use of all OPV will need to be stopped to prevent re-establishment of transmission due to VDPVs.